Complete everyday work, every time Work quickly and continuously with the LANIER MP C6004 Color Laser Multifunction Printer (MFP). Print colorful brochures, presentations and more at up to 60 pages per minute (ppm). Scan up to 180 images per minute (ipm) with the Single Pass Document Feeder (SPDF), and share documents instantly via scan-to capabilities. Save money with paperless faxing delivered right to your inbox. 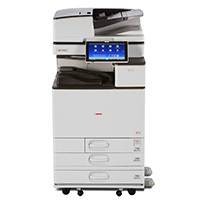 Minimize delays by accessing up to 3,000 documents at the device, extending paper capacity to 4,700 sheets, and taking advantage of a motion detection sensor that instantly powers up the MP C6004 as you approach the touchscreen.